Oh Lex, I could never share THAT story. This is a refrain I’ve heard hundreds of times from my clients and community members. In fact, at least 1/3 of the women in my Spotlight Speakers Collective said something like that while I helped them curate material for the speaker reels they filmed with me a few weeks back. I don’t want people to think poorly of me. Or think that I’m weak. Or don’t have my sh*t together. It took me over a decade as a speaker to talk about the impact childhood sexual abuse had on my identity (more specifically on my connection, or at times lack thereof, to my voice). And it’s even more uncomfortable for me to talk about my collapse into postpartum depression a couple of years ago after the birth of my daughter. 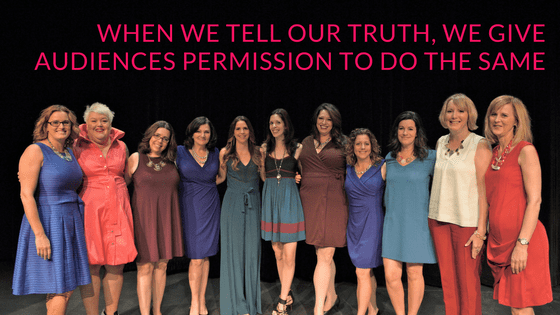 How could somebody who has built a business and life around empowering women (and men) to be confident in their voice lose her own voice during this sacred feminine rite of passage? But I do it. I breathe through the terror and I story tell because I know my audiences want me to share how I’ve taken the times where I haven’t had my sh*t together and learned and grown from getting through them. More specifically, my audiences actually trust me more as a speaker and speaking coach, as an entrepreneur, and as a thought leader, when I ditch the “I’m an expert and these are my top 5 tips” stuff and connect my stories to their fears, their struggles, and their aspirations – and use them to facilitate their breakthroughs. Your audience wants you to be honest about who you are, where you have been, what you are working on, and where you are seeking to go. The key is understanding how to tell stories that are about you – but are really about your audience’s transformation. There is so much I want you to understand, play with, and perfect as a storyteller on stage. From knowing how to curate an archive of stories to use in your live and virtual presentations, to knowing how to identify and troubleshoot your audience’s resistance to change through telling an ‘objection’ story, there’s a TON to master in this area. Therefore, I’ve decided to launch a 5-day Find Your ‘Secret Sauce’ as a Storyteller Speaker Challenge this October. -Position themselves as an ‘expert’ without trying to act like an expert. – Establish trust and intimacy with a live and virtual audience. -Concretize the ideas they want to be known for in the world. -Discover how to create powerful shifts in people’s thinking and behavior. -Enroll audience members into individual and group offerings. I’d LOVE to have you participate in the Challenge. Next Thursday I’ll be sharing with my audience my top tips for telling stories to virtual audiences. Whether you are creating webinars, online courses or simply want to connect with your audience through Facebook Live or podcasts, you won’t want to miss what I’ll be sharing. Be sure to sign-up for my newsletter below so you don’t miss this valuable (and actionable) content!